I was canvassing this evening for Boris Johnson in Desborough House, a block of Council flats on North End Road. There was a definite swing our way. Of course there needs to be. In 2004 Livingstone beat Steve Norris by 55.4% to 44.6% after the second preferences were allocated. What struck me about this evening was that nobody complained about Boris being a toff or suggested that he wasn't serious about the job. There were former Labour voters I met this evening who felt he cared about the problems that concerned them and had the enthusiasm and ideas to tackle them. By contrast the "Time for a Change" message is resonating. On woman in her nineties came to the door in a zimmerframe and told me: "Livingstone is past it. He's been there too long. He should make way for someone else." 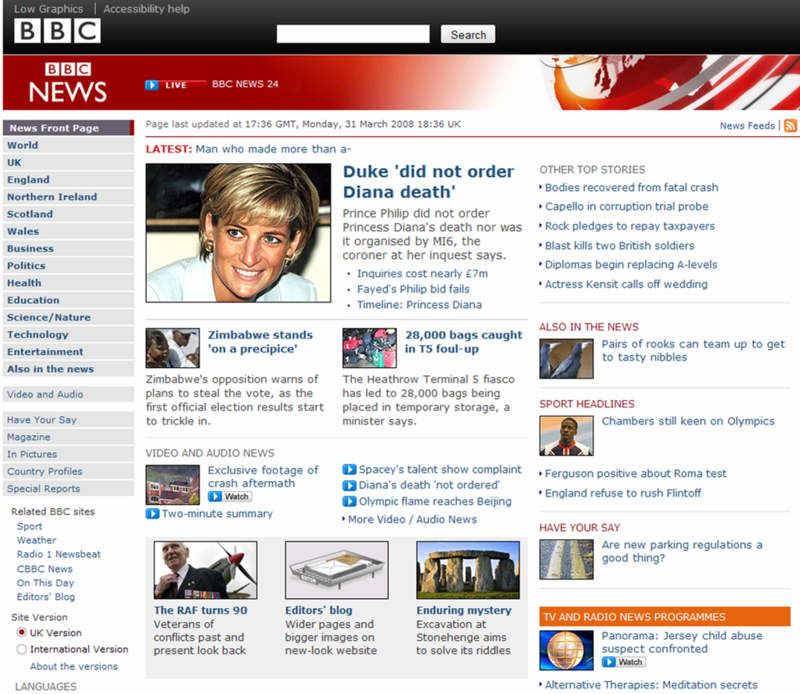 Any thoughts on the new BBC news website? Despite fears of negative reactions - especially in the wake of the web release of Holland's Geert Wilders' film Fitna - a German theatre went ahead with its stage adaptation of Salman Rushdie's The Satanic Verses last night, with no sign of trouble after authorities promised security precautions. "I think it is time for the Muslim world to say exactly what it finds so provocative about this book - simply to say, 'this book insults us', is no longer enough at some point." It's impossible to imagine a prominent British director sticking his neck out in this way. The British theatre sees itself as head and shoulders above the rest of the world, and yet for the most part it remains shamefully silent on this issue, or worse, backs down in the face of threats when it has tentatively put its toe in the water. As the battle for Basra progresses (Richard North has been the best at covering it), I'm not quite sure what is more depressing: The fact that Britain left Basra in such a mess or the fact that no British politician of any colour appears publicly concerned at what is happening there now. TIM RUSSERT, MODERATOR OF MSNBC'S MEET THE PRESS: "About 70 percent of the city of Basra controlled by Shiite militia. Is the goal to have that entire city controlled by the Iraqi government?" CIA DIRECTOR GENERAL MICHAEL HAYDEN: "Of course it is. But, but this is going to have to happen in stages. And, and you're right, about 70 percent of the city controlled by militia, armed gangs, criminal elements. It's, it's, it's a real stew down there, Tim, in terms of the different factions. And they were in a bit of an equilibrium between and among these armed factions over the past several months, and violence had been reduced. But I don't think anyone could think that that equilibrium was an acceptable long-term solution." While we wait to hear whether the old political regime in Zimbabwe has died, the conservation of the Zambezi basin ecosystems and wildnernesses is a living and ongoing concern. The Zambezi Society run by my cousins in Bulawayo, south western Zimbabwe, aims to spread the practice of good conservation techniques. Through this Society we can give this beautiful country our practical support. If there is a recession, how bad could it be? I’ve put a chart here showing real economic growth in the US since 1901. 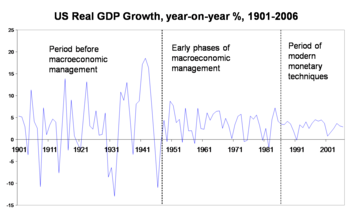 An alternative title for this graph would be “The vindication of macroeconomic management”. Many people tend to be quite dismissive of macroeconomists, thinking them little better than astrologers and little use for much beyond stimulating discussion. This graph tells you one very important reason why that’s wrong. Oh dear, I fear the Time magazine cover story on Britain's "unhappy, unloved and out of control" kids may be part of a wider Brit-bashing trend. "Last December, Ricky Hatton, a stout-chugging, ruddy-faced British boxer, was laid out on a Las Vegas canvas by the American welterweight champion Floyd Mayweather. The crowd of Union Jack–bedecked fans —“drunken dullards” and “boors,” according to The Daily Telegraph’s horrified sports correspondent—became so unruly that for the first time in its history, the MGM Grand casino shut down its archipelago of bars. Hatton’s troglodyte supporters achieved what was long considered impossible: They managed to class-down Vegas." Moynihan calls on Americans to correct their "self-image as lesser Brits", noting that "Europeans, who ranked the English as the “world’s worst tourists” in a recent Expedia poll, have long ago disabused themselves of such stereotypes." There are some who will see this sort of article as an insult. I think we should regard it as a wake-up call. According to a YouGov poll for today's Evening Standard. It also shows Boris getting more second preference votes, 18%, than Livingstone, 14%. When second preferences are allocated Boris is ahead of Livingstone by 56% to 44%. This is another good poll but the lead on first preferences is down slightly from 12% given in another YouGov/Evening Standard poll a couple of weeks ago. So we can't afford to put our feet up. Boris is working ferociously hard to secure victory and he needs the rest of us to do the same. Although liberal families' incomes average 6 percent higher than those of conservative families, conservative-headed households give, on average, 30 percent more to charity than the average liberal-headed household. Conservatives donate more time and give more blood. Of course the major caveat here when drawing comparisons to conservatives in the UK is that the major factor in the above stats is the religiosity of conservatives versus the secularism of liberals. In fact, the most tight-fisted group are the secular conservatives. What do you think a similar survey of the charitableness of party supporters in the UK would show? One of the heartening aspects of events that bring out big crowds, such as the Boat Race yesterday, is the enterprising spirit that goes with it. I live near the river so wondered down. Walking along the River I got to Riverside Studios and opposite them in Crisp Road the Asian teenage daughters of a grocers shop were doing a brisk trade in chicken biryani and lamb kebabs. Delicious. Despite the rain they were doing a brisk trade and they must have made a small fortune. Good for them. "Monsignor Vittorio Formenti, who compiled the Vatican's newly-released 2008 yearbook of statistics, said Muslims made up 19.2 percent of the world's population and Catholics 17.4 percent. "For the first time in history we are no longer at the top: the Muslims have overtaken us," Formenti told Vatican newspaper L'Osservatore Romano in an interview, saying the data referred to 2006." Defence Secretary Des Browne has given an outrageous interview in The Sunday Telegraph saying that Britain should negotiate with terrorist groups such as the Taliban and Hizbollah. "What you need to do in conflict resolution is to bring the people who believe that the answer to their political ambitions will be achieved through violence into a frame of mind that they accept that their political ambitions will be delivered by politics." 8,000 British troops are bravely putting their lives on the line in Afghanistan while their Secretary of State for Defence is talking about negotiating with a barbaric organisation that works hand in glove with al-Qaeda. This has to be one of the the most shameless acts of appeasement towards our worst enemies by a British minister in living memory. Gordon Brown should condemn the comments and Des Browne should be forced to step down over his disgraceful remarks. "The American President Americans have been waiting for"
John McCain has gone on air with the first television general election advert of the 2008 season; a sombre offering entitled "624787" which features footage of his time in a Vietnamese prisoner of war camp. The launch of this television ad coincides with the kick-off of McCain's high-profile 'Service to America' tour, a series of six speeches over the next week in places the Senator has lived and worked (Mississippi, Virginia, Maryland, Florida and Arizona) in order to highlight the experiences that have shaped his personal and political values. Negotiate with the Taliban? What really is Labour's agenda...? Des Browne's just said it again - we should negotiate with the Taliban. First, he said it at the Labour Party conference in September, then Blair's former chief of staff Jonathan Powell said it two weeks ago, now Des Browne has said it again...! Des Browne told the Daily Telegraph that we need to bring them "into a frame of mind that they accept that their political ambitions will be delivered by politics." But does Des Browne really understand what their political ambitions are? I've outlined these before on CentreRight. At the very least they are a radical Islamist state with strict and often arbitary sharia imposed on all. When Afghanistan actually had a Taliban government, the Taliban religious police were hated and feared - with good reason - by the majority of ordinary people living in Afghan cities such as Jalalabad where I lived at the time. The Afghanistan campaign is being fought under the auspices of NATO*. 60,000 troops from 39 countries other than America took part in the early stages of the Iraq war. In negotiations with North Korea, America has continued the six party framework with China, Japan, Russia and South Korea. Negotiations with Iran were handed over to the 'E3' of Britain, France and Germany. In pursuing peace in the Middle East the US is part of The Quartet which also includes Russia, the EU and the UN. George W Bush has rebuffed suggestions from John McCain that Russia be expelled from the G8, preferring continuing engagement. "I'm an MP for one of the fastest growing towns in the country: Witney. There's an incredible hub of science-based businesses in pharmaceuticals and technology that have the potential for further growth. Yet Witney doesn't have a railway station and is connected to the nearest city, Oxford, by just a single-carriage road. Local businesses there don't just need economic stability. They don't just need lower tax and fewer regulations. They need the infrastructure, in the broadest sense of the word, to succeed. They need good transport links so they get their goods up and down the country and beyond." Witney used to have a thriving train station. It was a mistake getting rid of it. Perhaps opening a new train station for Witney and many other places could make money and be achieved without subsidy. Even so I suspect Cameron is right in saying it would need some kind of Government intervention for such things to be achieved. Did you hear this morning's Today programme and Charlotte Green descend into giggles during the 8am news bulletin? Where's the evidence that we need the HFE Bill? In all the hullabaloo leading up to Bottler Brown's characteristically decisive "They can vote against it and then they must vote for it" compromise (can Ruth Kelly et al really persuade themselves that's a principled solution? ), attention has been diverted from the merits of the Human Fertilisation & Embryology Bill, and in particular the science base. It's all very well to warn opponents of the Bill not to overstate their case, but that must apply to all sides of the argument. Arguably there is an even greater onus on the proponents of change, to justify extending the law, with such serious issues at stake. "Human embryonic stem cells are yet to provide a single therapy for any human disease....(whilst) adult stem cells provide therapies for over 80 diseases...The reality is that most scientists worldwide have now abandoned therapeutic cloning and animal-human hybrids and are turning to adult stem cells." Tomorrow Zimbabwe goes to the polls and the reports are already coming out of the country of the ruthless way the ruling ZPF party of the odious Robert Mugabe is using force, intimidation and food to secure the 50% he requires to avoid a run off by securing 50%+ in the first round. The Central Intelligence Organisation (Mugabe's own Gestapo) is hard at work. The arguments about the ghastly nature of this evil, racist old man's regime have been well rehearsed. After turning the nation until recently known as "the bread basket of Africa" into an agricultural desert through his disastrous "land reform programme" (ie stealing land from skilled and experienced farmers and giving it to your mates and party loyalists) Zimbabwe suffers from inflation of 1,000%+ and unemployment rates of 80%. Well Geert Wilders' film 'Fitna' is finally out, as of last night, and so far there is no need to retire to the bunker. At the time of writing there's been a bit of rioting in Karachi but Holland itself is still standing if - thanks to its government - slightly cowed. The film itself - the edited YouTube version of which is above, click here for the full 15min version - is well worth seeing. It isn't for the faint-hearted: footage includes some of the most barbaric acts committed by the jihadists. But there's no burning of the Koran or ripping up of the Koran, or any of the other allegedly 'shocking' things which the Dutch government and others revealingly predicted would be in the film. The film simply shows what the Koran says and then shows footage of certain Muslims carrying out those words to the letter. To this extent, anything which people find shocking in the film should be put at the doors of Mohammed and certain of his followers, not Wilders. The importance of the speech by David Cameron on economic policy should not be underestimated. Some have asked how the Conservatives would be different to Labour and he is starting to sketch out the key areas. He acknowledges the basic Conservative desire for lower taxes, fewer regulations as well as economic stability. Yet what is really important is the widening of the Conservative engagement on economic growth into improvements to transport infrastructure and education. This is well founded. The OECD did an in depth review into what makes economies grow. It concluded that key to faster growth are better transport infrastructure, greater success at research and development, a more flexible job market, lower taxes along with knowledge and skills. For a more in depth discussion of why these issues matter, see a couple of articles here (page 28) and here. The key reforms needed are in the areas of vocational education - especially for success in helping the 5m people who could work yet do not get off benefits and into work. This stronger engagement by David Cameron will do much show how the Conservatives can be trusted with the economy and help deepen the case for change. I attended a conference hosted by the Center for Policy Studies today on ‘the post-bureaucratic age’. Its greatest exponents admit this is not the snappiest of titles. But workmanlike or not, the morning’s speeches grouped around the topic were electrifying. There was a large number of Shadow Cabinet and Shadow Ministers present; Michael Gove, David Willets, Eric Pickles, Sayeeda Warsi, Oliver Letwin, Greg Clark, Caroline Spelman, Grant Shapps and others. Detailed reference was made to the work of other colleagues not present, like Chris Grayling and his paper on welfare reform. David Cameron attended for most of it and gave his concluding remarks at the end. "No wonder we live in a country where the Grand National doesn't start on time and hotels fall into the sea!" Given all recent controversy over Speaker Martin's refusal to reveal the expenses of Members of Parliament, it's only fair to give credit where credit's due and praise the Commons authorities for the publication of the costs associated with at least one aspect of Parliamentary business: Early Day Motions. According to House of Commons Factsheet P3 published in February 2008, "the printing and publication costs associated with Early Day Motions in financial year 2005/06 were approximately £627,000" exclusive of the costs of "editorial preparation and control and electronic publication". The need for YouTube to be "socially responsible"
By my calculations, £627,000 is enough money to pay the annual salaries of 32 newly-qualified nurses, 31 trainee teachers and 20 junior doctors. EDMs are expensive, wasteful and have potential to turn Parliament into a laughing stock. They should be abolished.